Here we are at the 4th day of the Easter season or Bright Wednesday as it is known in the Orthodox and Byzantine Catholic traditions. The whole week after Easter Sunday to the following Saturday is called Bright Week and is considered to be a single continuous day. But are we living this week as Bright Week or just No-Longer-Lent? According to the Council of Trullo: “from the holy day of the Resurrection of Christ our God until New Sunday (i.e. Thomas Sunday) for a whole week the faithful in the holy churches should continually be repeating psalms, hymns and spiritual songs, rejoicing and celebrating Christ, and attending to the reading of the Divine Scriptures and delighting in the Holy Mysteries. For in this way shall we be exalted with Christ; raised up together with Him. For this reason on the aforesaid days that by no means there be any horse races or any other public spectacle”. In pre-revolutionary Russia, the taverns used to be closed during Bright Week, and no alcoholic beverages were sold. Hmmm, that would cramp the average Catholic’s No-Longer-Lent style. OK. Singing. Rejoicing and celebrating Christ. Delighting in the Holy Mysteries. No horse races. Got it. Ouch. Sherry’s got it, and she’s Catholic; I’m wonder how many of the people I hang with can say they’ve got it. Look, for one week out of the year the altar in the church stands with all the doors wide open and the curtain drawn back, showing the empty tomb of Christ and the fact that “middle wall of partition,” as St Paul has it, has been broken down, that the cherub’s “flaming sword no longer guards the gates of Paradise,” that the new life in Christ is flooding into the world. Who among our faithful know that the altar stands open like that for all of Bright Week? Or what it means? Or cares? As a Priest, I freely admit that I’ve scarcely got steam left in me for Agape Vespers, much less Liturgy on Bright Monday, and Bright Tuesday, though I always celebrate Liturgy on Wednesdays, so Bright Wednesday isn’t a problem. But it’s the only day in Bright Week I celebrate Liturgy. And Great Lent plus Holy Week is a long time to go without three square meals, adequate sleep, and … other things. 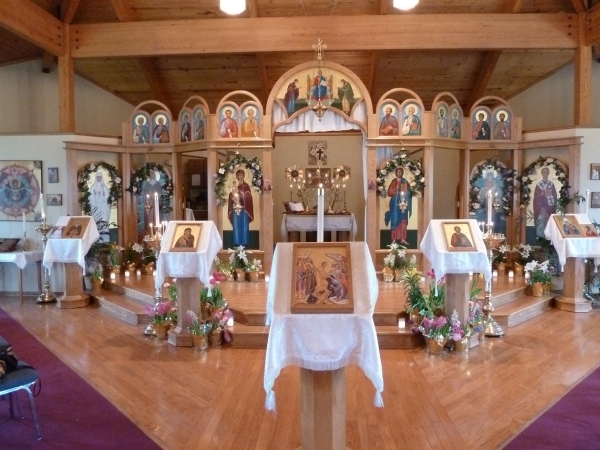 After Communion at the Divine Liturgy do we Priests not say, “O great and holiest Pascha, Christ; O Wisdom, Word and Power of God, grant that we may truly partake of You in day without evening of your Kingdom.” Well, dear hearts, Bright Week is The Day Without Evening Of His Kingdom that we pray about. If we don’t honor it here in the type, will be be able to honor it there in reality? Alas, I don’t think it’s Bright Week for many of us. Rather, Sherry is right: it’s just no-longer-Lent. I confess I miss the rigors of Great Lent and the daily services of Great & Holy Week. I’ve no place to put the pent up energy I’ve got, nothing much with which to channel it. I think I’ll quit sitting at my desk for a while and sneak back over to my quiet, empty church, where the doors of the altar stand wide open and inviting, where cor ad cor loquitur, and where, just maybe, my own heart, hearing the call, will open up a little bit in response. Posted on April 28, 2011, in Random thoughts. Bookmark the permalink. 3 Comments. Is there any Orthodox equivalent of the Catholic practice of Adoration? Fr. Michael, your statement is true only if you are speaking strictly of the service of Adoration. However, the manner in which we prostrate before the Eucharist, especially in the service of the Presanctified Gifts, surpasses even the Roman Catholic adoration of the real presence.